You know iOS is as smooth as butter but there are a few things it misses that users have been asking for since forever: better notification system and some sort of widgets for example. How would you feel if you have to open up an app every time you want to check the time? Similarly, there are things that users want at the first glance on the screen, let’s say weather update? The new Fahrenheit app serves the purpose well. The app uses push notifications to notify users of current weather in the notification bar, based on their location. All you have to do is set your location and allow push notifications for the app and it does the rest. Pretty handy app in my opinion and interestingly delivers the weather information without widgets. 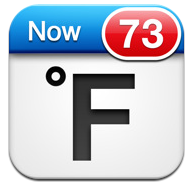 Fahrenheit – Temperature on your Home Screen! Fahrenheit is a stunning new weather application that uses latest technology to show you the current temperature of any location right on your iPhone/iPad Home Screen! Beyond the real-time temperature on the Home Screen Fahrenheit also is the number one weather application giving you very detailed weather information of unlimited cities world wide, packed in a gorgeous design and easy-to-use user interface! 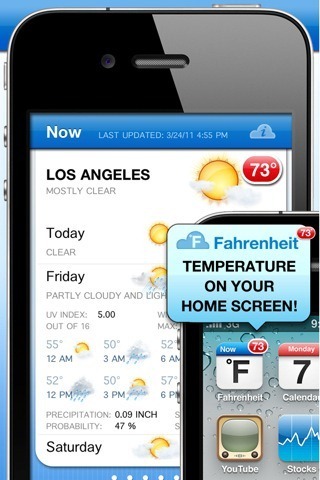 Fahrenheit is backed by an online web server that uses Push Technology to push the current temperature of any location to your iDevice. This makes it possible to always automatically have the up-to-date temperature displayed in the red badge at the top-right of the Fahrenheit icon on your Home Screen. Fahrenheit supports all iOS Devices: iPhone 4, iPhone 3Gs/3G, iPad 2, iPad and all iPod Touch devices! It comes only for a price of $0.99.